Bernard du Bucheron creates a magical land with characters who come alive in The Voyage of the Short Serpent, a story about truth, obsession, and the myth of utopia. Written in a jubilant mock-archaic French, Court Serpent by Bernard du Bucheron won the Grand Prix of the Academie Francaise for this highly original story set in a fourteenth century colony subsisting on a frozen Greenland outpost. 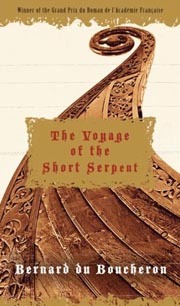 After communications with the Greenland colony are lost, a ship named the "Short Serpent" is launched with an abbot at its helm to reestablish contact and to revive the inhabitants' faith. To their horror, the colony's inhabitants are discovered to have reverted to a very primitive way of life exhibiting excesses of filth and depravity to which the crew of the "Short Serpent" begin to succumb.
" Court Serpent was lucky to find a translator of such expertise that a rather difficult text, written in mock-archaic French, and laden with a whole cargo of technical terms, was beautifully rendered in equally mock-archaic and technical English. "